Concrete is one of the most versatile materials to use outdoors. I can be used for retaining walls, walkways, driveways and more. While its versatility makes it popular, there are drawbacks. Concrete by nature is very porous. It absorbs anything that falls on the surface be it water, oil, or dirt. Concrete, like all outdoor surfaces, should be cleaned and protected regularly. 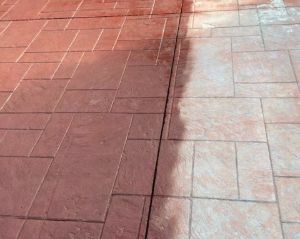 Our pressure washing company in Springfield, MO recent cleaned and protected a concrete walkway and driveway in a bright red: chili pepper red to be exact. 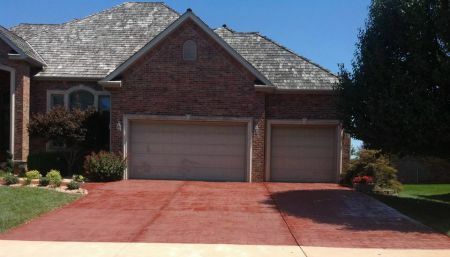 The stamped concrete driveway was in need of some TLC and the owners really wanted to breath new live into its color. During the cleaning process, Renew Crew used eco-friendly concrete cleaners that dig deep into the surface loosening set in stains and dirt. Special care and attention is paid to hard stains, like grease and oil, that are commonplace on driveways. When the cleaning solutions had done their job, a pressure washer was used to rinse everything away. Before protecting the surface it was given time to dry properly. Unfortunately it’s all too common for concrete to be simply cleaned and not sealed, and the protection is the most important part! Without a protective layer, the concrete will continue to absorb materials instead of keeping them on the surface and able to rinse away with just water. Concrete cleaners and protectants come in a variety of colors and finishes. Some homeowners prefer a matte natural look while others like a slightly shiny wet looks to enhance the rich colors. Renew Crew can do it all. For this project, the homeowners wanted a standard color throughout and really liked our rich, chili pepper finish. The sealant was rolled on to the surface and into the stamped design throughout for an even finish. If you’re concrete is showing its age, please reach out to one of our pressure washing locations.